National Health Blog Post Month, Day 2: My TV Show. You’re blog is being turned into a TV show! Congrats – you’ve earned it. In fact, you get to co-write it. Write about the TV show based on your life or blog. All of my creativity when it comes to the print & motion picture industry may or may not have been used up yesterday. Yes, I realize it’s only day 2 of the National Health Blog Post Month challenge. Fortunately, the idea of a TV show about my blog doesn’t have to be a theatrical production. A circus production on the other hand is exactly what a TV show of my blog should be. I write about life with diabetes. 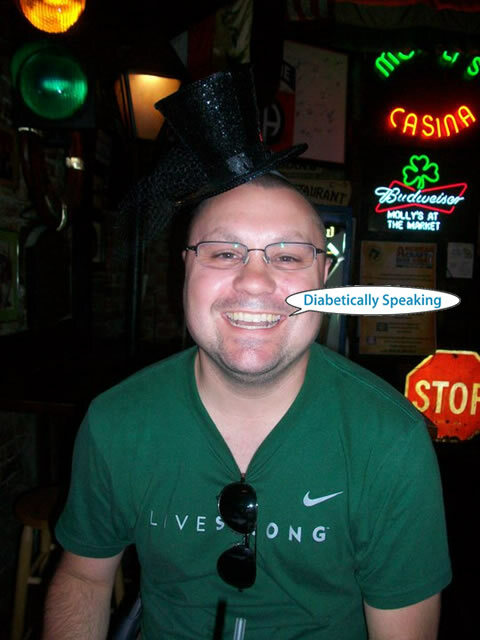 I don’t write a clinical how-to step-by-step instruction on living with diabetes. When it comes down to it, after over three decades with it, diabetes is often a complete and utter mystery to me. Why else would I be able to do the same exact thing one day to the next, and get totally different BG readings, have to take totally different amounts of insulin, and have to figure out the mystery that is diabetes every single day? It’s a mystery, wrapped in an enigma, wrapped in baloney. Or bologna if we’re being proper. But who says “bologna” anyway? It’s baloney. So is diabetes. So there. When I think about diabetes, and Diabetically Speaking too, it really has all of the elements of the greatest show on earth: the circus. For example, there is the Blood Sugar Tight Rope act. This is where skill, luck, and the ability to balance reality with whimsy come together to walk a fine line of blood sugar “control.” You know, like trying to maintain that magical and elusive 104 mg/dL that was mentioned yesterday. Next, we have the elephants. Come see the elephants! The elephant is when you find that your blood sugar has surprisingly dropped too low while you’re in the middle of something important and seemingly noninterruptible, and you can’t pry yourself away to treat it and get your wits back. So what happens? You end up prolonging your time with the elephant until you’re a sweaty, shaky, slow moving and confused mess and someone has to help feed YOU the circus peanuts. There is also the Diabetes Trapeze. This is the exact opposite of the tight rope act, where your blood sugars are going up and down and all around all day long while you chase them with a bolus here, and a bolus there, here a bolus, there a bolus, everywhere a bolus bolus. This is in the same family as the Glucoaster (not to be confused with D-Coaster Day, which is going to be happening again in 2012, so watch out for the announcement real soon). Hahaha, yay for dark comedy! omg you are wearing a tiny top hat. that does not appear to be a ‘shop. the only thing that would make it better is if you were talking on a tiny cell phone. my spidey senses tell me this photo was taken on st. patrick’s day. i am glad you had the perfect blog in which it could be used. circus life indeed!